With every change of season, I feel the need to catch up on my filing and clean my desk drawers. I’m fairly organized most of the time, so it’s not that big of a job and it makes me feel oh, so happy. That’d be 31 cards. Clearly, I need a bigger wallet. Some are on the keyring, but I never take that keyring, so… In fact, I never have these cards in my possession when I shop. Who needs them anyway? They’re all tied to a phone number. Sure, you can get the app and type them all in. But why bother? CLEARLY I am not loyal to NINE grocery stores. That’s just silly. 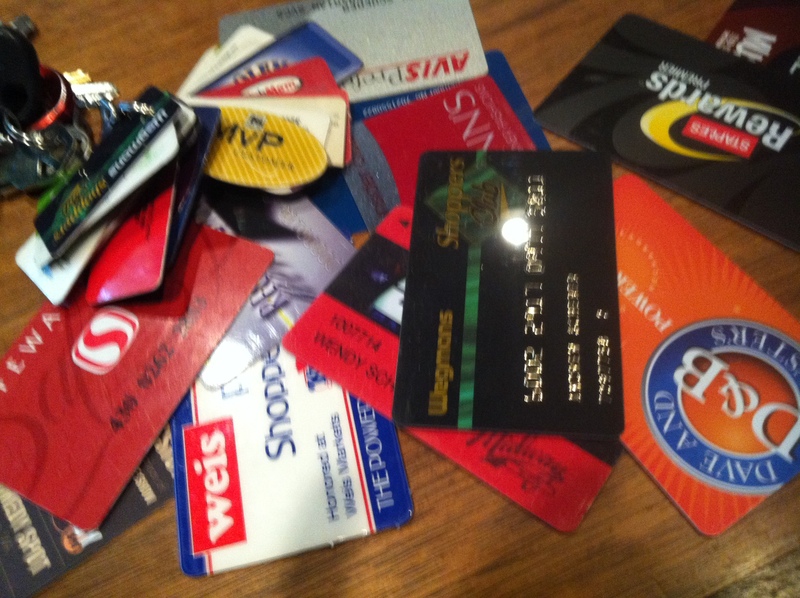 These are not loyalty cards where I’m rewarded to frequent the store. These are discount cards so I don’t feel like a LOSER by not being able to get the SPECIAL price just for cardholders. Seriously. How aggravating is it to see a price on the shelf but not get that price? Well, not me. No sirree. I get the member price at every store. And the cost? Being in their database. Let’s look at that, now. Of those stores, four are within reasonable driving distance. Another is a bit farther and another is almost an hour away (but one is coming soon to our area.) Two of the stores aren’t within 150 miles of me. I got them on extended trips. Of the nine stores, I get mail and/or email from one. ONE. The store that is one mile from my house. It’s not my favorite store and not the one we choose for big shops, but it’s definitely the one where we stop and pick up milk or few things. Often. They send me offers. They use their database. The others? Nothing. So from their point of view, what is the benefit to me having a loyalty card? So I can get the discount when I happen to be in their store? Are they selling the data and that’s the big score? I’m not getting mail from the manufacturers either, so I don’t think they are. At least not in a big way. So I’m thinking that these programs cost money to administer, reduce the profit margin for the store, and don’t increase loyalty. Well, at least in my focus group of one. And looking at the other cards – say pet supply. I have the two big competitors and whichever is on my way or has the better price is the place I stop. Loyalty. Right. In fact, looking at all the cards I have, I’d say the only one I’m really loyal to is the auto repair shop. And lookie there – I only have the one card. Interesting. I’m not implying that I’m not a loyal shopper. I’m loyal to many brands. But no store has me. I’d be very curious to see if I’m alone in this. Hey grocery store marketing folks, I know a great social media research firm who could study this for you. I know, it’s ridiculous. (hangs head in shame) Thanks for commenting! The idea of a loyalty card is not to directly enhance loyalty but to gather data and convert it into usable information, although you may see this as a loss of profits because they are not directly contacting you and they are giving you discount, this is not the case, you will fall under a target demographic most likely ‘Price sensitive’. so your information is most likely used as a guideline for pricing, sales promotion, product quality, etc. however to the company it would make no sense to directly contact you because as you said you’re not a loyal customer. but if they can take what they can from your usage of their store, products and loyalty cards they can enhance the shopping experience for your demographic and other users of the store. Yes, of course and thanks for commenting. I understand the value of the programs to the retailers – and to the consumers. I was (nearly 4 years ago hehe) trying to say that they were a must-have cards and joining the ‘club’ had nothing to do with loyalty, though the programs are called that frequently. Since this writing, a couple things happened: 1) my husband starting doing all the grocery shopping and 2) he chose Wegmans as his store of choice. Just FYI. Times change! Thanks for commenting, AJ. Happy almost the weekend!